Anji Mountain Contemporary Rainbow Rugs are made from 100% quality bamboo from the remote Anji Mountains in China. 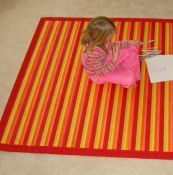 These rugs are considered one of the finest bamboo rugs. Anji Rugs are easy to clean and ecologically friendly providing a beautiful accent to any style of flooring in any area of the home.